In 1987 BILFAL were awarded its first job of this kind. The scope of work required the fabrication of two (2) new Pyrolysis Furnace and include: Engineering, Material Procurement, Fabrication with complete modularization of the two units, Transportation, Site Installation. 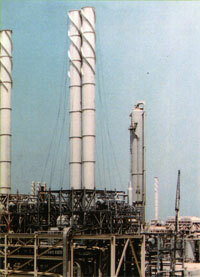 ETHANE STEAM CRACKING HEATER : In 1988 BILFAL already a well reputed supplier for Furnaces following its first job for Petrokemya, was awarded a contract from ABB Lummus Heat Transfer System for two (2) Ethane Steam Cracking Heaters as part of SADAF expansion project. BILFAL scope of work Included: Engineering, Material Procurement, Fabrication & Erection. PYROLISIS FURNACES : Following the successful completion of the two earlier contracts for Petrokeimya and SADAF, BILFAL once more was considered qualified and competitive to carry out the Fabrication & Installation of two additional Pyrolysis Furnaces for the Ethylene Projects, client was SADAF and Brown & Root was the General Contractor. BILFAL scope of work covered : Mechanical Design, Material Procurement, Fabrication & Site Erection. 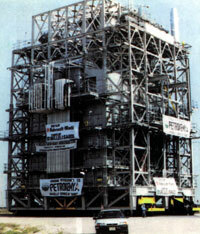 In 1994 Hitachi Babcock and BILFAL formed a consortium to carry out the contract awarded by Petrokemya of Nos. : 4 Ethylene Furnaces as part of the 150,000 MTPA Ethylene Expansion Project. BILFAL scope of work included: Engineering, Material Procurement, Prefabrication, Complete Modularization (No. 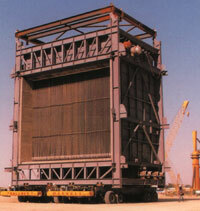 2 Furnace Modules of 1600 Tons each, No.2 Piperack Modules of 300 Tons each), and Transportation to the plant & Erection. Besides the major projects here carried, through the year BILFAL has been involved with several clients (SAMAD, AR-RAZI, PETROMIN, IBN-SINA, PETROKEMYA, SAUDI ARAMCO) in activities of Maintenance, Overhauling, Replacement etc. strengthening its leading position in these fields of activities.